Koilonychia – a.k.a. the ‘spoon nail’ – relates to many causes! Koilonychia (a.k.a. ‘spoon nails’) occurs when the free edge of the nail is turned inside out (everted), resulting in a concave fingernail. One must also be aware that in the hands of children a ‘spoon nail’ may occur as a normal condition of the nail (not caused by a disease). Fingernail quality depends on the weather! Fingernail manicure is ok, but the weather will shape your nails! This week British fingernail research pointed out that the weather plays a major factor in the shape and quality of your nails. The researchers found that a humidity of 55% is perfect for growing strong, lengthy fingernails. Good news for British women! For, the climate in the UK often meets the perfect weather condition for growing beautiful fingernails. A lower humidity will make brittle fingernails, while a higher humidity will make your fingernails more bendy! • The medical causes of brittle fingernails! • A nail product search page! • More news about fingernails! Michael Jackson had abnormal fingernails, but not due to his vitiligo & lupus! 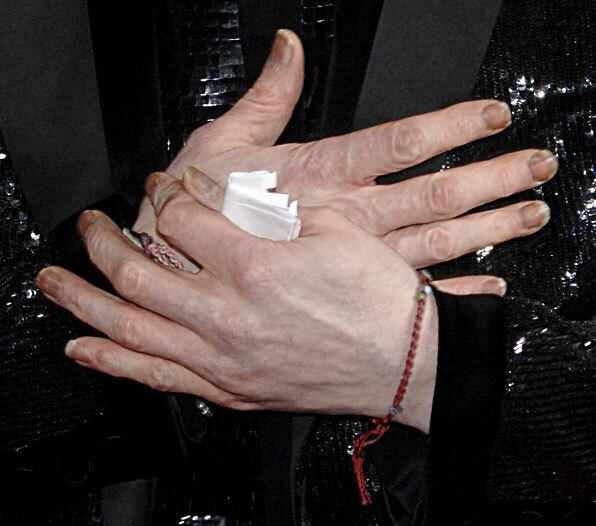 Michael Jackson’s fingernails in 2005 (left), 2006 (center) & 2009 (right) – ‘click’ for larger versions! Michael Jackson had abnormal fingernails, but his nails were not related to his vitiligo & lupus! While the first autopsy results related to Michael Jackson’s death were presented earlier this week, there are still many discussions about the state of Michael Jackson’s health – only a few days before his death his health was described by his spokesman Doctor Tohme Tohme as: a ‘perfect health‘. In the perspective of his death it is also important to know that Michael Jackson was diagnosed in 1986 with vitiligo and lupus. Lupus is known as a potentially lethal disease (heart disease is a major complication in lupus! ), but in Michael Jackson it was recognized to be in remission. 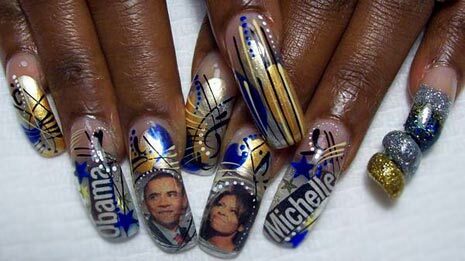 Anyhow, one can still wonder: can his fingernail problems be related to the vitiligo and/or the lupus? The answer to this question appears to be a simple: ‘no’! • Irregular, twisted, and dilated vessels at the cuticle. 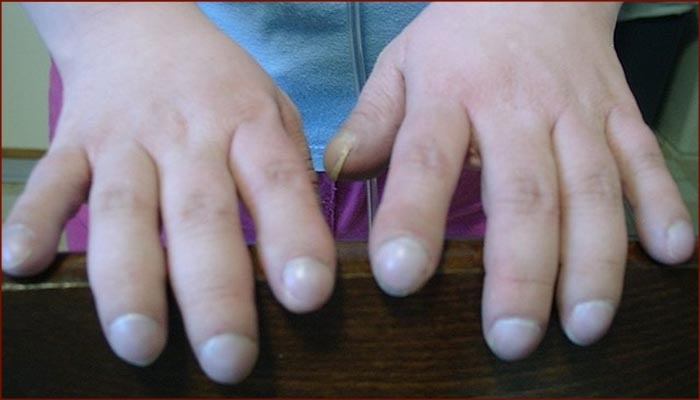 Out of the 4 described fingernail disorders related to vitiligo and lupus, the 4th can be related to his hand deterioration that was observed in 2009. But none of these fingernail disorders can be related to the typical looks of Michael Jackson’s fingernails during the last 3 years of his life. 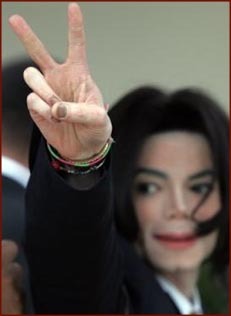 But one should not forget that Michael Jackson’s fingernail problems were first recognized by the media in 2006, when members of Michael Jackson’s family were terrified that his escalating dependence on prescription drugs had become a danger to his life. While Michael Jackson’s lupus was considered to be in remission, one could also speculate that his hand deterioration + his sudden death might have signaled a lupus relapse … due to an excessive use of prescription drugs??? • In memoriam: ‘The hands of Michael Jackson’! 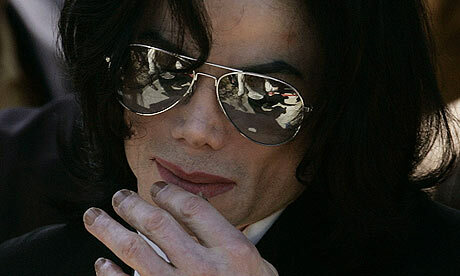 • Michael Jackson’s hands: a clue to his sudden death? • Michael Jackson’s hands: a manicurist’s worst nightmare! Fingernail disorders: what are Beau lines? Beau’s lines are horizontal grooves in the nail plate that represent an arrest or slow-down in the growth of the fingernail (more specific: the nail matrix). The depth and width of the Beau line reveals the abruptness and duration of the causal event, and Beau lines move distally with the growth of the nail plate. This finger nail condition was named by a French physician, Joseph Honoré Simon Beau (1806–1865), who first described the condition in 1846. • or a serious trauma. • Fingernail disorders in the hands of children! • Fingernail disorders in elderly patients! • Michael Jackson had abnormal fingernails! Anatomy of your fingernail: the nail matrix! The matrix is an ‘invisible’ part of the fingernail – but nevertheless it’s the most important aspect of the nail because nails grow form the matrix! Fingernails are composed largely of keratin – a hardened protein which is also present in your skin and hair! As new cells grow in the nail matrix, the older cells are ‘pushed out’, compacted, and take on the familiar flattened, hardened form of the fingernail. “The matrix of the nail the germinative epithelium from which the nail is derived. There is controversy about whether the nail bed and nail fold contribute cells to the substance of the nail plate. Regardless of this, the matrix is responsible for the majority of the nail plate substance. 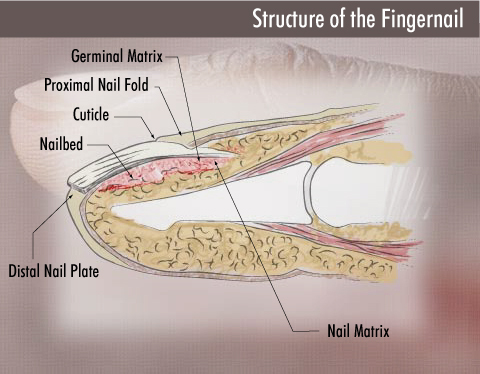 NOTICE: The so-called ‘root’ of the nail is also known as the germinal matrix. Example of a nail matrix injury (A) + the repairment (B). Fingernail clubbing may signal lung cancer + other lung, heart & stomach diseases! Fingernail clubbing relates to lung cancer! More than 2 centuries before today the Greek philosopher Hippocrates had recognized that a ‘clubbing fingernail’ is often a sign for the presence of a serious disease. Now the ‘clubbing fingernail’ (a.k.a. 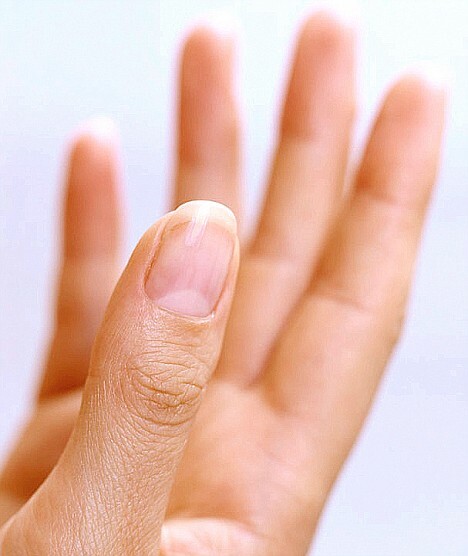 the ‘Hippocratic fingernail’) is associated with lung cancer and various specific other diseases, including: lung, heart and gastrointestinal problems. 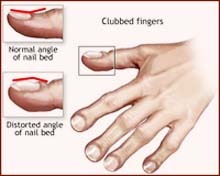 How to recognize a ‘clubbing fingernail‘? ‘Clubbing fingernails’ are characterized by increased distal finger tip mass + increased longitudinal & horizontal curvature of the nail plate. This fingernail condition is characterized by a large angle between the nail plate and the proximal nail fold: larger than 180o, whereas in normal nails the angle is less than 160o: see the picture below. • Development of the clubbing fingernail: treatment & prevention! • The meaning of clubbed fingernails in elderly patients! 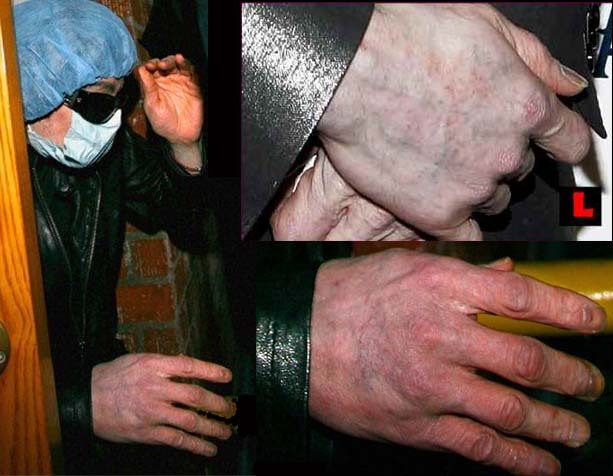 • Did Michael Jackson suffer on skin cancer? Anatomy of your fingernail: the lunula or lunulae! The lunula, or lunulae (a.k.a. the ‘nail moon’), is the crescent-shaped whitish area of the bed of a fingernail (or toenail). The lunula can also be described as the visible part of the nail matrix – which is the ‘root’ of the nail. The lunula or the white ‘half moon’ at the base or proximal end of the fingernail is particularly smooth, flat and shiny. The whiteness of the lunula is still a matter of controversy but its absence – especialy when the lunula is not present in the first finger (thumb) – could be described as notable and important. In certain chromosome abnormalities the lunula is absent, i.e., monosomia 4 and the lunulae may be diminished in trisomy 21 (= Down syndrome).